In the left image, we can see the Randolph Engineering logo on the lens, but it seems to be removed in the other photos. Zac Efron as Matt Brody wears Randolph Engineering Aviator sunglasses in the Baywatch movie (2017). 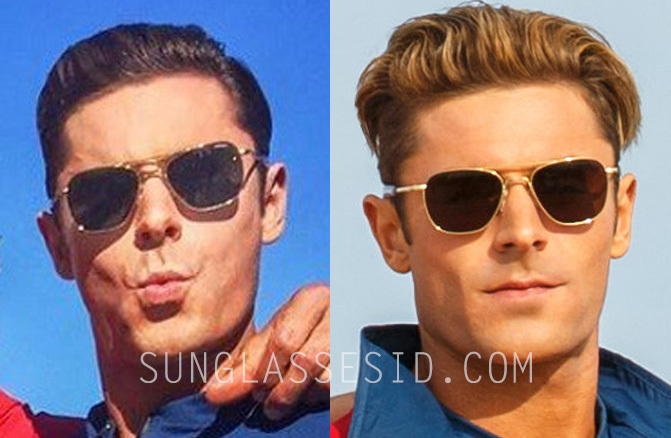 Efron wears the Aviator model with 23k gold frame. It's hard to see which color lenses are in the frame, it looks most like AGX lenses, but could be grey as well. This model sunglasses can be recognized by their bayonet temples, that are designed to fit comfortably under headgear. 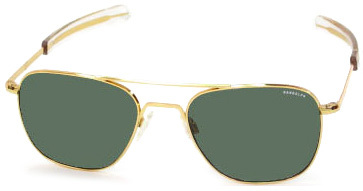 Buy RE Aviator sunglasses online on Amazon.com, Amazon.co.uk, Randolph Engineering, or eBay. There are different sizes, colors and temples available, so make sure you get the pair of your preference. Zac Efron seems to wear the largest variation of the glasses. In the same film, Dwayne Johnson wears a pair of gold Sama Syd sunglasses.